Most homeowners opt for fixed-rate mortgages because there aren’t any surprises. Many of them go with a 30-year term because it’s the norm, and also because it allows would-be homeowners to buy a lot more home. The major downside is that a 30-year fixed mortgage takes 30 years to pay off. In other words, you pay a whole lot of interest over three decades, and you don’t really own much of your home for the bulk of the amortization period. In fact, it’s not until late in the loan period that payments go primarily toward principal, as opposed to interest. This can create problems down the road, especially for those who put little down on their home purchase. After all, without any home equity, lenders don’t have a buffer in place if borrowers fall behind on payments. And borrowers who don’t have much (if any) skin in the game can simply walk away if things don’t go their way. How About a 15-Year Fixed That Isn’t Super Expensive? Unfortunately, 15-year fixed mortgages aren’t cheap, seeing that the borrower has half the amount of time to pay off roughly the same sized loan. This explains why 30-year loans continue to be a lot more popular, despite what I just said. 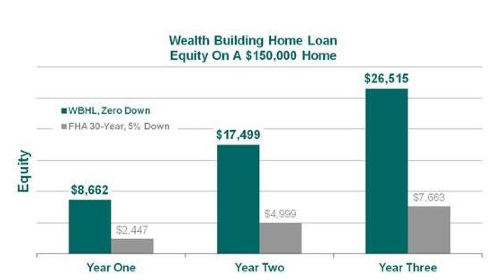 But that may all change with the advent of the Wealth Building Home Loan (WBHL), created by Edward Pinto and Stephen Oliner of the American Enterprise Institute (AEI). In a nutshell, it combines the equity-building benefit of a 15-year fixed mortgage with the affordability of a 30-year fixed. So borrowers pay down their mortgages faster without breaking the bank. Speaking of banks, borrowers also gain a lot more home equity in a shorter period of time, which greatly reduces the credit risk associated with extending high loan-to-value loans. In fact, during the first three years of a WBHL, 77% of the monthly mortgage payment goes toward principal. Compare that to a traditional 30-year fixed, where 68% goes toward interest. Sure, the payment is substantially lower, but the house still mostly belongs to the lender. A 15-Year Fixed Rate Below 2%? In order to keep monthly payments down and maintain home buying power, the AEI notes that a conventional 15-year fixed is priced around 0.75% below the going rate for a 30-year fixed FHA loan. Additionally, the WBHL allows for zero down financing, with five percent in down payment funds repurposed for a permanent 1.25% rate buy down. Its creators also claim that the annual credit risk expense on the WBHL is lower, and the strong savings component of the loan program allows for a slightly higher debt-to-income ratio. The 15-year averages around 3.25% today, so borrowers could enjoy fixed rates in the high 1% range. Not too shabby. All this apparently gives borrowers who go with a WBHL more than 90% of the purchasing power they’d normally get via the FHA and their standard 30-year fixed product with 3% down. For the record, Pinto has long taken issue with the FHA for overcharging borrowers and sticking them with costly mortgage insurance premiums. Unfortunately, most renters need an FHA loan to buy a home, so there aren’t many other options. While the WBHL certainly sounds like an interesting and potentially game-changing loan product, not everyone actually wants to pay off their mortgage faster. Some people would rather invest their money elsewhere. But there are a lot of positives to the WBHL, both for borrowers and lenders, and it does make sense for lower-income borrowers to create wealth as opposed to dig deeper into debt. This mindset could actually help us avoid another crisis, or at least postpone one. The WBHL is being launched by the Neighborhood Assistance Corporation of America (NACA) and Bank of America this month. Over the next few months, it will be rolled out to NACA’s 37 offices. A WBHL for middle-income home buyers is also in the pipeline. If interested, inquire with NACA. Thanks Colin. For more information on the 15 year Wealth Building Home Loan with NACA, folks can visit us at naca.com or our NACA Forum. Can you give an example of how this would work in practice? Say the house costs $250,000. What would be the monthly payments on this new WBHL vs a traditional 30 yr fixed? Apparently the WBHL can be priced as low as 0.125%, as opposed to say 4.25% for a 30-year fixed. So the monthly payment on a $250k loan would be around $1,400 on the WBHL 15-year fixed. On a standard 30-year with 5% down, the monthly payment would be around $1,200. So basically a borrower would pay a tad bit more each month but pay off their loan in half the time (and gain equity a lot faster). This means less risk for lenders and borrowers because the homeowner will actually have skin in the game in a few short years, if not a few months. Sounds good. Also, would there be any PMI on the loan? Probably on the 30 yr fixed. How about the WBHL? How would lenders make money on this product if the rate is as low as 0.125%? (and it would be fixed for 15 years)…. Yes, it’s a 15-year fixed. And I don’t think there’s PMI, though if there were, it wouldn’t last long because the homeowner’s LTV would sink rapidly via a low rate and 15-year amortization. As far as making money, good question. I’m assuming most of the rate buydown occurs via the 5% down payment funds and the 15-year term, but if some homeowners are getting really low rates it’s probably a subsidy. However, there is perceived lower risk on the loan, which makes it more valuable and less risky than a 30-year loan. So where do I go to get a loan like this. I believe Citi and BofA are offering it at the moment. Contact either bank or NACA directly to get details and to see if you’re eligible. May my daughter refinance using the WBHL? She has excellent credit and has been on-time with her mortgage payments. She has a 30yr fixed FHA loan. She is in her sixth year and has $89,000 loan remaining. Thank you. (Exploring a refinance, we found a 15 yr fixed loan at 3.49% with an appraisal of $385 and a credit check of $13 and the bank, SunTrust, would put the loan cost of $2,000ish into her new mortgage.) I don’t understand “mortgage speak”….and I don’t want my ignorance to cost my daughter $$$. She is a hard working teacher and single mom. Thank you VERY much!! In the first three years 77% of your payment goes towards principle. What is it after the three years? Also are there rules on how many WBHL loads you could have at a time? I think the point they are making is that the interest rate is so low on a WBHL that a huge percentage of the payment goes toward principal each month, and that keeps growing over time. As the years go on, interest will make up a tiny sliver of the total payment because the interest rate is so low, and also because the WBHL is a 15-year loan, as opposed to 30. Not sure how many you can have, but guessing just one initially? I’m not sure if the WBHL comes with a refinance option. My guess is purchases only, but you never know. Contact NACA to see if a refinance is possible. Good luck! Can the WBHL use for refi? Not sure Warren, I’ll look into it, but my guess is that it’s more a purchase-based program. Hi Colin, thank you for the article. I heard about the loan on NPR and am fascinated. I’ve been unable so far to find any hard information from any lender online. Do you know if this product will be available to finance investment properties? I kind of doubt it seeing that the WBHL seems to be a program aimed at making homeownership more affordable for lower-income borrowers with little in the way of assets. They compare it to the FHA so my guess is no, but you never know. Do you know if there is a contact at NACA? I have been trying to find someone, as my company would love to start offering this product to some of our customers. Try Rick Herrera, he commented on this post when I first wrote it. He works for NACA. What kind of scam is this? How is this any different than taking out a 15 year loan and paying points?